Change of the Guard At Buckingham Palace - A Step By Step Guide. Changing the Guard, or Guard Mounting, at Buckingham Palace is the procedure by which the Old Guard at the palace switches duty with the New Guard. It is one of London’s most popular, and crowded, ceremonies. On most of the days when it takes place, it can seem as though the world and its mother has turned out to watch, and getting a good view of the proceedings can be, to say the least, difficult! However, it is possible to get some extremely good views, if you know where to stand, and in this article we'll take you step by step through the process. It often comes as a surprise to visitors to learn that the men you see on duty outside Buckingham Place, and at other Royal locations, are not just ceremonial guards. They are, in fact, professional infantry soldiers who will have seen, and will see, active service all over the world with the British Army. They are some of the finest soldiers in the army and, at Buckingham Palace, they are known collectively as The Queen’s Guard, which consists of two Detachments – the Buckingham Palace and the St James’s Palace Detachments. Guard duty is usually performed by battalions of the Household Division, although, from time to time, most frequently in August, other infantry battalions and units will mount the Guard. Usually, however, the soldiers who guard Buckingham Palace are members of one of the five regiments of the British Army’s Foot Guards. These are – The Scots Guards, The Irish Guards, The Welsh Guards, The Grenadier Guards and The Coldstream Guards. At first glance you might think that there is no way to differentiate between the five regiments since each one wears the tall bearskin cap, bright red tunic, black trousers and shiny black boots that make them instantly recognisable. But there are several ways to tell them apart, since each regiment sports different plumage on their bearskins, each sports a different collar badge, and each will have a different arrangement to the buttons on their tunics. The Grenadier Guards have a white plume, worn on the left side of their hats, their collar badge is a Grenade and their tunic buttons consist of a single line. The Coldstream Guards wear a red plume on the right side of their caps, they sport a Garter Star collar badge, and wear their buttons in twos. The Scots Guards have no plumes, their collar badge is a Thistle, and they wear their tunic buttons in threes. The Irish Guards sport blue plumes, worn on the right side of their bearskins, their collar badge consists of a Shamrock, and their tunic buttons are in fours. The Welsh Guards have a green and white plume, worn on the right side of their caps, they have a Leek on their collar badges and their tunic buttons are arranged in fives. Although most people make their way to Buckingham Palace to witness the Guard Change, the ceremony itself takes place between three locations – Buckingham Palace, St James’s Palace and Wellington Barracks, where the Guards themselves are stationed. To see the most of, and derive the most enjoyment from, the ceremony – and of course to get those all important photographs and videos – it’s worth moving between these three locations. The ceremony gets underway at around 10.30am, when those soldiers who are about to finish their Guard shift at Buckingham Palace assemble in the courtyard at the front of Buckingham Palace. At the same time the detachment of soldiers that are ending their shift at St James’s Palace will assemble in Friary Court, to the rear of the Palace. Since they are about to march to Buckingham Palace, this makes a good place to begin your visit to the Changing The Guard ceremony. The nearest Underground to St James’s Palace is Green Park Underground Station, and it’s wise to arrive here at around 10.20am to give yourself plenty of time to walk to St James’s Palace. Leave Green Park Station via the Piccadilly South Exit and turn right along Piccadilly itself. Head past the Ritz Hotel and, at the traffic lights, go right along St James's Street. At the end of St James's Street you will see the gatehouse of St James's Palace. Turn left in front of it, and go first right into Marlborough Road, crossing to its left side. Ahead, you will see an immense crowd of people. Make your way through them, a few polite “excuse men's wouldn’t go amiss at this point, pausing as you do to look across the road where you will see the Old St James’s Palace Guard lined up in Friary Court. Don’t, however, waste too much time here, but rather, take a few photographs and walk on to pause on the corner by the traffic lights at the junction of Marlborough Road and the Mall. At around 10.43am the Old Guard will come marching straight towards you and straight past you en route to the guard change at Buckingham Palace. You’ll get some great photos and footage of them from this vantage point. Be careful. however, not to step in front of them for a better shot as you will attract the irk of the police on duty here. Once they've gone past, and turned right towards Buckingham Palace, don't do what the majority of those present will do and follow them. Instead, make your way over the Mall into St James's Park via the gates opposite. Follow the path ahead and cross the foot bridge over the lake – you’ll get a terrific photo of Buckingham Palace to the right as you reach the centre of the bridge. However, don’t dally too long as time is of the essence at this point. Once over the bridge, go right and, after a few steps, cross diagonally left over the grass until you reach the road. Cross cautiously to the railings of Wellington Barracks, where you’ll see the New Guard preparing to march to Buckingham Palace to relieve the Old Guard. The best thing to do at this point is make your way past the Barracks and, just after the main gate, cross the road towards Buckingham Palace and plant yourself on the corner between Wellington Barracks and Buckingham Palace. At around 10.57am the New Guard will march from the barracks and walk straight past you en route to Buckingham Palace, once more affording you some great photo moments as they go past. The New Guard will march in to the courtyard of Buckingham Palace, halt, turn to face the New Guard and then slow march into position. At this point the Old and New Guard present, or display weapons to their mutual respect for each other. Next, the two Captains march forward and meet in the centre of the forecourt where they will touch left hands, at which point the Captain of the Old Guard has, symbolically, handed over the responsibility for the safety of the Palace to the Captain of the New Guard. Once this has been done officers from the Old and New Guard make their way to the Guard Room where the ammunition is handed over to the New Guard and discuss Royal movements that are due to take place over the next 24 hours. At this point sentries from the New Guard will assume their positions (each sentry will be on duty for two hours at a time). 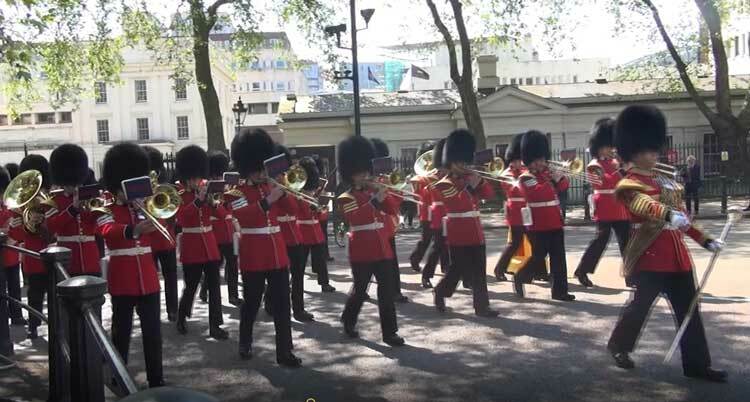 Whilst all this is going on, in order to keep visitors entertained, the band forms a circle in the centre of the Buckingham Palace forecourt and plays a selection of music. A little before 11.30am, if you make your way back to The Mall’s junction with Marlborough Road, the New St James’s Palace Detachment will come marching towards you en route to take up duty. At this point it is safe to leave, knowing that you have seen all there is to see of the pomp and ceremony that accompanies the Changing the Guard at Buckingham Palace. Now, where’s Alice got to? 11.00am, although we suggest you arrive at 10.30am and allow till noon to get the most out of the ceremony. Green Park or St James Park. The Guard change can be cancelled in bad weather.